The library is pleased to host a month long trial to PolicyMap. PolicyMap is an easy to use platform for mapping data, and generating data tables or reports. Depending on the source data, you can get as granular (census blocks or zip codes), global (states) or particular as you like by drawing and defining custom areas. Layered mapping allows you to identify areas that meet multiple criteria, a function critical to site selection of businesses, services and studies. The data PolicyMap draws from are primarily a federal alphabet soup. Think HUD, BLS, CDFI, CDC, NCES, NOAA, USDA, IRS, BEA, USGS, SSA to name a few. Of course the Census Bureau serves as the backbone. Some nonprofit and community organizations have contributed data as well. In fact PolicyMap was developed by a local nonprofit, The Reinvestment Fund (TRF), a lending organization devoted to community redevelopment. To learn more about how to use PolicyMap you can signup for a webinar or view their video tutorials: Quick Start, Maps, 3-Layer Maps, Reports and Data Loader. Villanova has subscriptions to three other resources incorporating similar mapping features, Social Explorer, ESRI Business & Community Analyst and Data-Planet. Social Explorer presents the ability to do deep historical dives into Census demographic data with mapping capabilities. 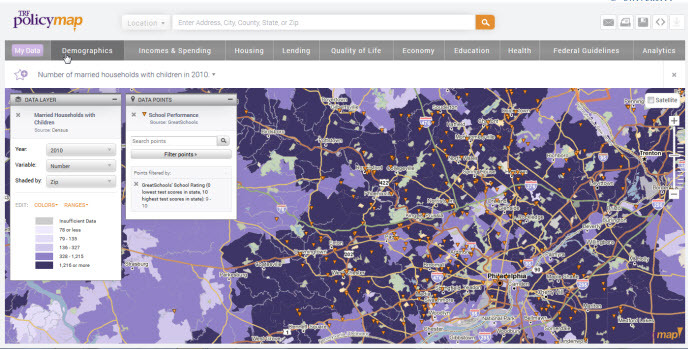 ESRI Business & Community Analyst closely parallels the sophisticated functionality and broad range of data sources offered by PolicyMap, but requires individual account administration. Data-Planet’s mapping and analytic tools may not be as compelling, but its data sources have the broadest appeal for academics and scholars.